The basic structure of the vehicle is the frame and it provides a good anchor point for the suspension system. There are two types of frames; integral frames, or ‘unibody’, and conventional frames. A conventional frame is basically a ‘one-piece’ frame; or two ‘one-piece’ frames fastened together. These frames are extremely rigid to keep all the parts of the car in perfect alignment, which are attached to it. It is constructed of heavy steel and welded or cold riveted together. Cold riveting keeps the rivets from shrinking after they cool off. The integral, or unibody, frame is just the opposite. With this type of frame, the body parts are used to structurally strengthen the entire car, and all of the sections are welded into one piece. Sometimes the parts of the body and the suspension system are attached and reinforced. 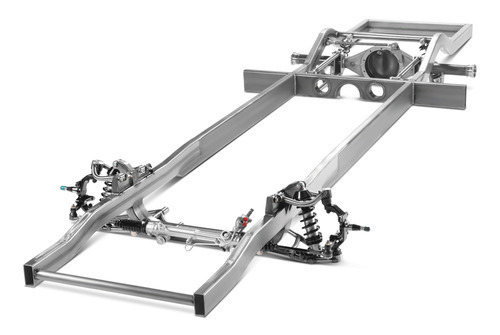 Also, some unibody frames have partial front and rear frames for attaching the engine and suspension members.